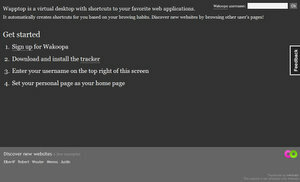 Wapptop is a virtual desktop with shortcuts to your favorite web applications. It automatically creates shortcuts for you based on your browsing habits. Wapptop is built on the Wakoopa API.